Slip-on "ProForm Slim" trousers by RAPHAELA BY BRAX – PAULA! Exclusively for PETER HAHN! 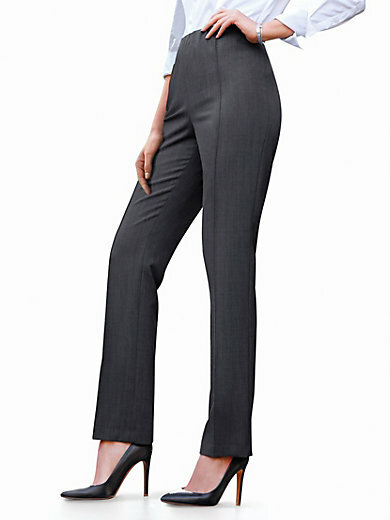 Feel-good trousers that look great and fit perfectly. While the bi-elastic material guarantees comfort, the high new milled wool content ensures a pleasant, soft feel and exquisite look. Comfortable cut in an elegant look with a fully elasticated waist, pockets integrated into the side seams, top-stitched tucks at the front and pre-pressed creases at the back. With a narrow thigh width, several waist widths and straight legs. Ankle width approx. 15ins. Easy-iron material: 52% polyester, 43% new milled wool, 5% elastane (LYCRA® – a brand by INVISTA for premium stretch fibres and materials). Regular length approx. 32ins; short length approx. 30ins. The slip-on trousers are machine washable.